Eddie Redmayne on playing the role of Newt Scamander in Fantastic Beasts and Where to Find Them. 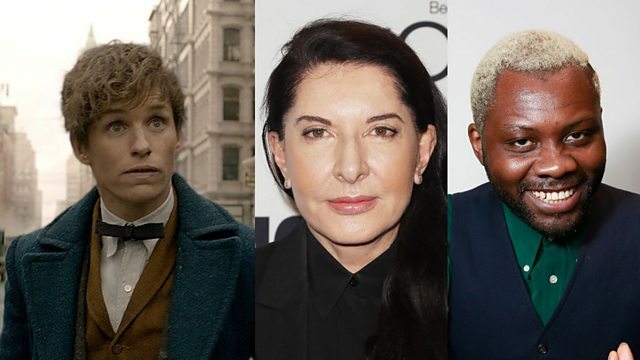 Eddie Redmayne talks about playing the role of Newt Scamander in Fantastic Beasts and Where To Find Them and the walk JK Rowling wanted him to adopt. Director David Yates and producer David Heyman discuss shooting the scenes involving the magical beasts. As she hits 70 the controversial performance artist Marina Abramović considers the relationship between pain and art. Singer Kate Bush tells us how terrified she was being on stage again. Michael Fassbender discusses working with director Derek Cianfrance on his new film The Light between Oceans and shooting 40 minute long takes. Joining Nikki in discussion are the British Nigerian film director Joseph A. Adesunloye and music critic and film fan Elin Unnes from Sweden.